'Jungle Jim' is an underrated comics which has been overshadowed by legendary US comics artist Alex Raymond's other works, 'Flash Gordon' being the most famous one. However, not ony its artwork is bestowed with the quality of other Raymonds works from the pre-war era, but its characterizations and narratives are also noteable for many reasons. Simultanously as 'Flash Gordon was commissoned by the King Features to compete with 'Buck Rogers', 'Jungle Jim' was commissoned as a competitor to 'Tarzan' and both debutted on Jan. 7th, 1934 as complementary Sunday features (see the below image for the first appearance of the hero on its first page). Though only the Raymond byline appeared on the comics, it was scripted by Don Moore and most reference sources identify him as the creator. Moore (1904-86) was a former newsman who was editing adventure stories for a NY magazine when he was recruited into the comics field by the King Features. Later he would move onto television as script-writer. At least at its inception, Jungle Jim was clearly modeled directly on real-life adventurer Frank Buck who was very famous in those years on the basis of his best-selling memoir book Bring 'Em Back Alive and its movie adaptation with the same title, which he himself starred. In the first story, Jim Bradley alias Jungle Jim was presented as a trapper and tamer capturing wild-life specimens for zoos, precisely as a fictional replica of Frank Buck. Moreover, he was based in the Malay peninsula, which happened to be the setting of Buck's first movie. 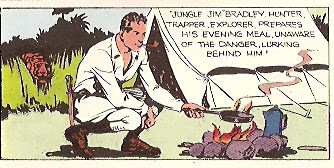 Jim was accompanied by a native "servant" named Kolu, making 'Jungle Jim' probably the first American adventure comics to feature an inter-racial duo as protagonists, predating Mandrake and Lothar by several months. Moreover, whereas the pre-war Lothar was portrayed frequently as an 'all muscle, no brains' figure strictly for ridicule, Kolu was a genuinely indispendable right-hand man for Jim with no inferiority attributed to him, other than being an employee. Actually, at least in the first one and a half years of the comics' run which I have read so far, Kolu, thanks to his marksmenship talent, turned out to be Jim's saviour at the last moment in more occasions than Jim saved him or other people! Furthermore, in one occasion (Aug 8th, 1934), he speaks on behalf of himself and Jim, in the presence of Jim and a third party without Jim expressing his opinion first. Bits of scarce info on the web name Jim's steady as Lil De Vrille, but a blonde named Joan appears as the candidate for this role in the first stories. 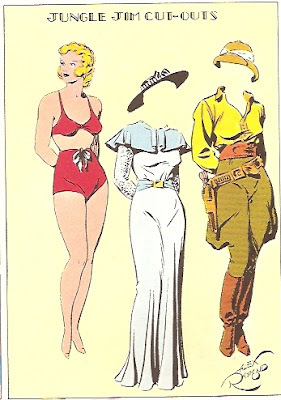 Despite the fact that she is introduced into the comics by way of being rescued by Jim and Kolu from jungle perils (see the above image), she doesn't turn out to be the standard feminine stereotype, asking for instance Jim to teach her to tame wild animals (which he complies) and joining the men in dangerous missions as any other character (withoout any objection from Jim). To revert to comparison with the Mandrake strip, she is the direct opposite to Narda, and on even more equal footing with the male protagonists than Phantom's Diana. The graphic and narrative qualities of the comics evolve progressively during the comics' first one and a half years' run. None of the adventures have episode titles, so I will be assigning them codes for convenience. JJ01 (7.1.1934-3.3.1934): Almost every single page has Jim fighting a wild animal leaping at him in the forest during the course of a simple story about a villain named Tiger Peters (Joan is his daughter) stealing the animals Jim had captured. The adventure ends with Peters managing to escape, taking his daughter with him. JJ02 (3.3.1934-3.6.1934): This adventure has got a more interesting and relatively more complex story, but the plot is poorly developed. A black lion is terrorizing a nearby tribe and Jim sets out to capture this never before seen specimen. On the other hand, a white guy seeks refuge from natives who want to sacrifice him to a god. It turns out that an evil white man has imposed himself as god onto a tribe and using this power to extort money from foreigners. However, how and where the black lion angle fits into this schema is not satisfactorily explained, esp. with regards to the double revelation that, on one hand, some of the attacks attributed to the black lion were the work of natives in costume and on the other hand the black lion was real enough itself. It seems Moore was undecided on what course the story should develop and eventually could not manage to pull all the conflicting ends let loose. As for the racial representations involved in this story, Jim's earlier reference to the native tribe dominated by the white villain posing as a god as "ignorant blacks" appears as a fly in a glass of milk and yet in the end, when he urges these folks to return to their "old faith that taught you kindness and brotherly love", the comics stand in contrast to the racist rhetorics of colonialist stories. JJ03 (3.6.1934-1.7.1934): This mini-episode perhaps should better be viewed as a prologue of the next adventure. A panther captured by Jim turns out to be the pet of a jungle boy named Zobi, who'll accompany him and Kolu in the coming adventure. It seems writer Moore was tentatively considering introducing Zobi as a permament side-kick in this period. JJ04 (1.7.1934-30.9.1934): An old friend of Jim visits him to request help in defeating a gang robbing gold miners. The leader of the gang turns out to be Tiger Peter from the very first adventure and hence Jim and Joan reunite. Except for one single instance of a lion attack, this is a standart action adventure, climaxed by gun fights, without any jungle perils and could have been set in any location and not necessarily in the jungle region.